Perfume Bottle -- Antique, repro, recast? What is it? Need opinions on a recent eBay purchase. First let me say that I’m a 25-year member of the International Perfume Bottle Association (IPBA). My collecting specialty is commercial bottles pre-1900 to 1940s. I’m a collector/dealer. This bottle was purchased for my collection -– not for resale. In my haste to Buy-It-Now, didn’t notice the bottle measured 10” long – unusually large for a perfume bottle. I’ve seen perfume bottles made in the shapes of guns, generally small in size, 4” or 5” long, in clear glass. However, I’ve never seen this shape or color before. My gut feeling – this bottle is not as old as the markings would indicate. Is it an antique, a repro, a recast? 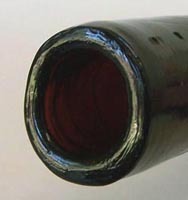 Wouldn’t a bottle that is 130 years old have the patina of life – light scratches? little dings here and there? This one is just as shiny as the day it was produced. Color: Brown or very dark amber. Size: 10” long x 4 1/2” high (overall from bottom of handle to the highest point on top). Weight: 12 oz. (very heavy for an empty perfume bottle). Don’t know the parts of a gun – will do my best to describe. Opening to bottle is smooth. 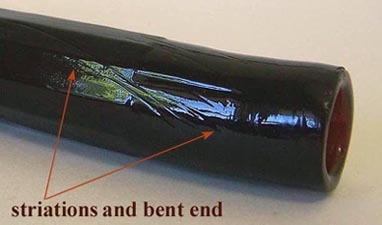 End of barrel is bent. 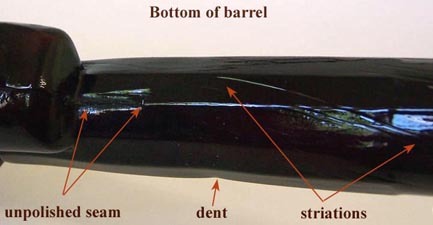 Multi-faceted barrel shows striations in the glass, and an area that simulates the look of a dent that might be found on a real gun. Visible seams all-over that pretty much disappear in the facets on the top and bottom of the barrel. No stopper. A bottle this old would have had a cork stopper, or possibly a cork attached to a cotter pin with ring. 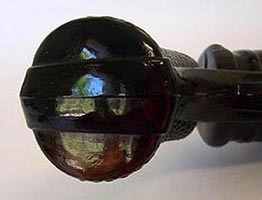 Missing stoppers are common on pre-1900 perfume bottles. Tried searching for a design patent on the U.S. Patent and Trademark Office’s web site. Was hoping to find a patent drawing that would show the detailed design and possibly the specs for this bottle. Gave up after half an hour – it’s like trying to find a needle in a hay stack. Can someone tell me how to navigate my way through the P&TO’s mountain of codes and links to find what I want? Would appreciate it. Have not left feedback for the eBay seller. Will wait to hear comments. My sister and I are collector/dealers. 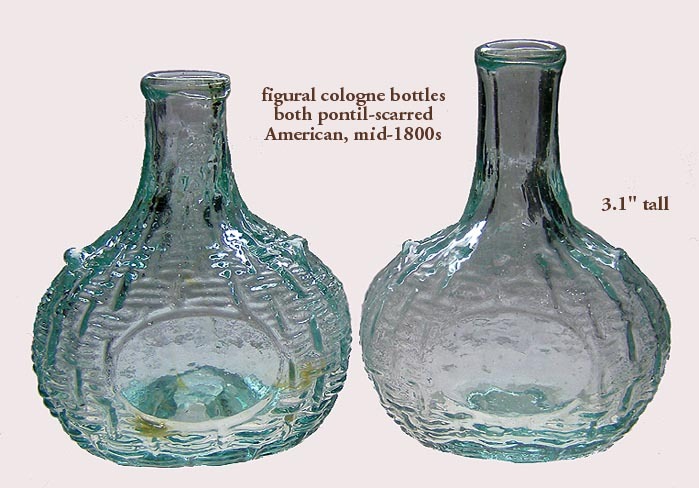 We have a web site where we sell vintage perfume bottles – www.scentserely.com. Resized pics twice. Hope they're not too big. Joan - Thanks for posting. I would say most bottle collectors know figural guns to be candy containers. All the examples I have seen have threaded openings that are ground on the end. See this eBay auction as an example. I am not saying this bottle isn't old but it does draw some suspicion. When searching patents, spend some time looking specifically at Design patents...that may help with your search. What an unusual perfume bottle. It is listed (and figured) in Albert Christian Revi's 1970 book, AMERICAN PRESSED GLASS AND FIGURE BOTTLES. It is called "Revolver Bottle." "Emanuel W. Bloomingdale of New York City patented a revolver-shaped bottle on November 6, 1888. . . . dark amber-colored glass . . . has the patent date and the legend 'Standard Per'f Wk's' impressed in the glass near the trigger. . . . held perfume . . . 10 inches [long]." This must be the "ugly duckling" of perfume bottles, but it may be an uncommon find. Thank you, thank you -- Chris and Harry! I'm very grateful for the info and appreciate your comments. I'm a "purist" -- always want the original in my collection -- no repros, recasts or later redesigns. I like figural and/or colorful bottles and fell for this one. Always research before I buy -- but this one I didn't. Have over 90 reference books in my perfume library, devoted solely to perfume bottles -- includes collector books and auction catalogs. After-the-fact research -- this bottle is not pictured or identified anywhere. I purchased a book on Milk Glass for the purpose of documenting one bottle in my collection. I'd like to purchase the book Harry mentioned. Just went online and found it with a publication date of 1973 -- not 1970. I'd like to buy it -- is it still ok? Also tried searching the P&TO -- again. Found the patent drawing by entering the patent number Chris supplied. But still couldn't find it by patent date. Found tips on searching patent date and came up with a Field Code of "APD" and a Field Name of "Application date." The date an application was filed may be different from the date the patent was actually granted. Even so, don't know where or how to enter this info. I'd like to know how to search for design patents in the future. Again, thanks much. You were very helpful and I will recommend your site to my perfume bottle buddies! Yes, Harry, this bottle is, without a doubt, the "ugly duckling" in my collection. Come to think of it -- I sold a bottle from my collection that was also brown in color. It was made of celluloid and the bottle and cap replicated alligator skin! Every time my sister looked at it -- the comment was the same: "Get rid of it -- it's ugly."! It was unusual -- pictured in a collector book -- but it sure was ugly!! Well, now that I have the attention of a perfume collector, here is a perfume/cosmetic bottle that I have wondered about. While I think of this bottle as a cologne, a similar mold was used to produce H. LAKE'S INDIAN SPECIFIC and perhaps other early medicines. I've never been able to identify the "N.S.P" embossed on the shoulder of this sparkler. Can you offer any help? The Guerlain company (famous for Shalimar fragrance) produced some very large cologne bottles (c. 1853). They are similar-looking to this one, but not the same. They have ground glass stoppers, sloping shoulders, a paneled front but no bulge in the neck. The glass was of French manufacture. I've searched a reference book of 3,400 perfume companies from around the world and could not find a company name that could be identified with the initials N.S.P. 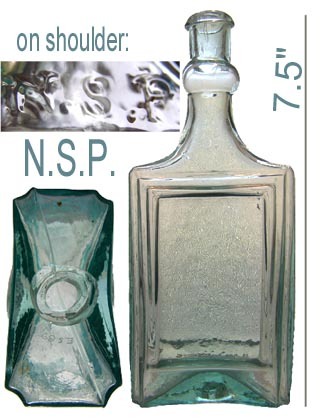 I've never seen a bottle like this and am stumped with the initials on the shoulder. I'm thinking it could be the name of a glass company -- but most glass companies put their logos on the bottoms of bottles -- not on a conspicuous place like the shoulder. Wish I could be of more help. Thank you, Joan . . . I appreciate your research effort. Better known glass on my shelf . . . figural demijohns attributed to the Sandwich Glass Company. I collect demijohns, so I had to have these.